Excited for the island hopping! Seeing the nature at its finest is one of the many reasons why I am an outdoor person. Moving away from the city life for a while in order to experience what nature has to offer relieves so much stress and puts me back in perspective and focus. 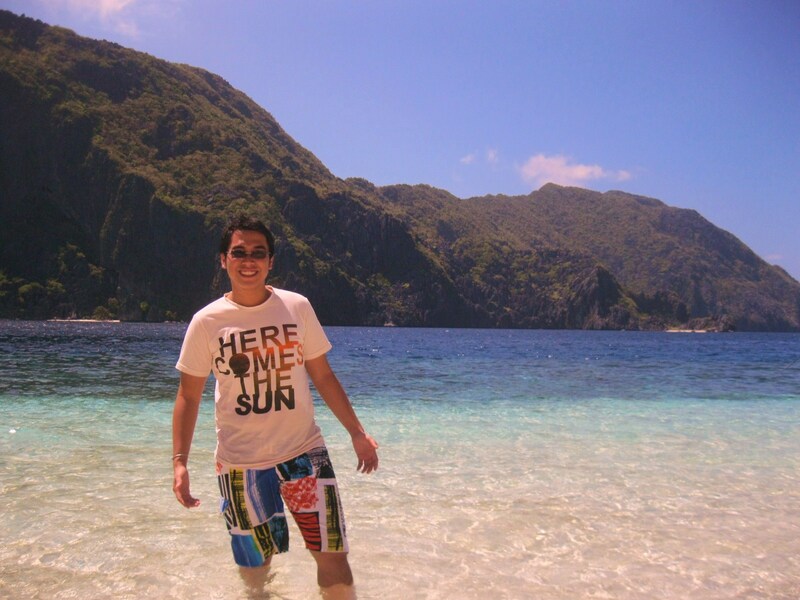 No wonder that it was so easy for me to decide to take a short vacation to El Nido, Palawan when I had the opportunity. 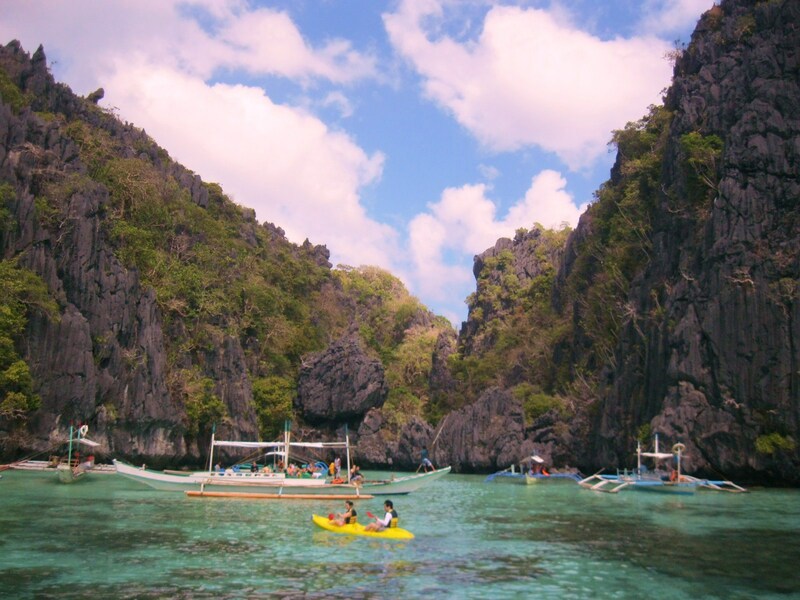 Most people have this misconception that taking a vacation in El Nido is expensive. 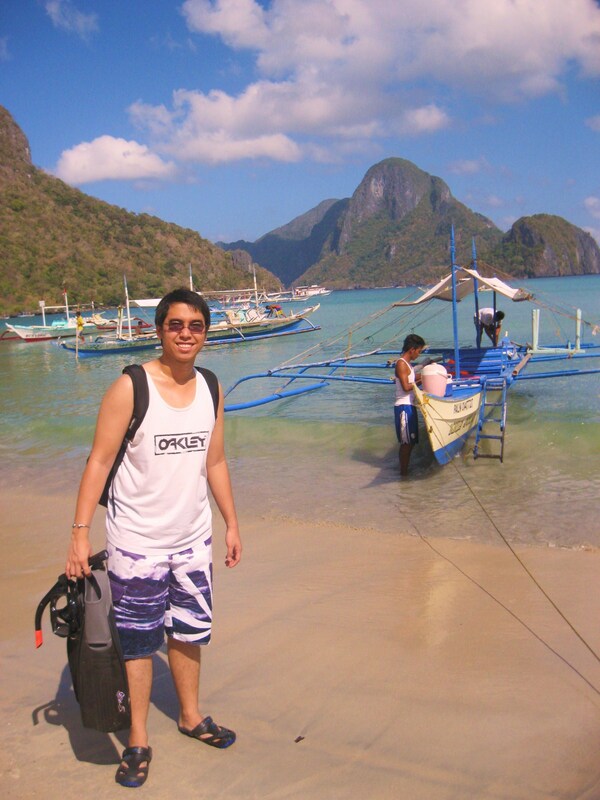 Apparently, that’s not what we experienced when we had our trip to El Nido last March 16-19, 2013. Believe it or not, our stay in El Nido for 4 days and 3 nights is only as expensive as that 3-day-2 night vacation in Boracay. 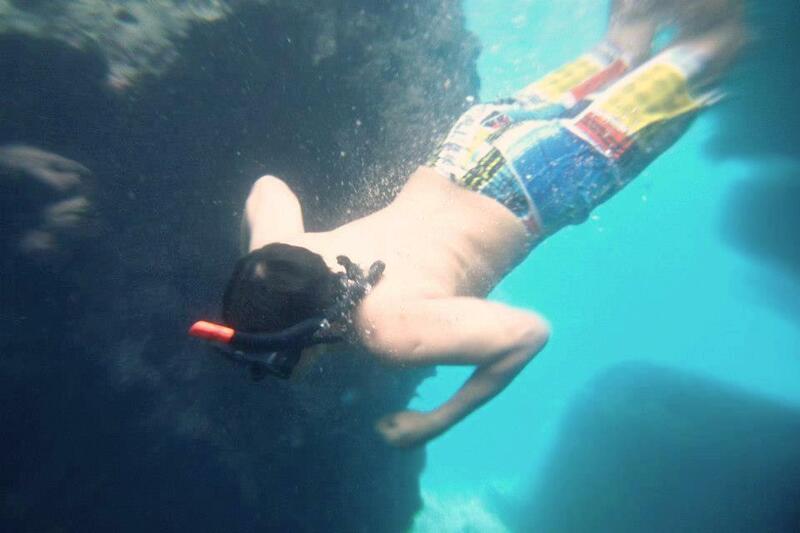 If you are a beach lover and a party animal, go to Boracay. But if you are this type of person who loves having a peaceful getaway and wants to have that better encounter with nature, go to El Nido, Palawan. 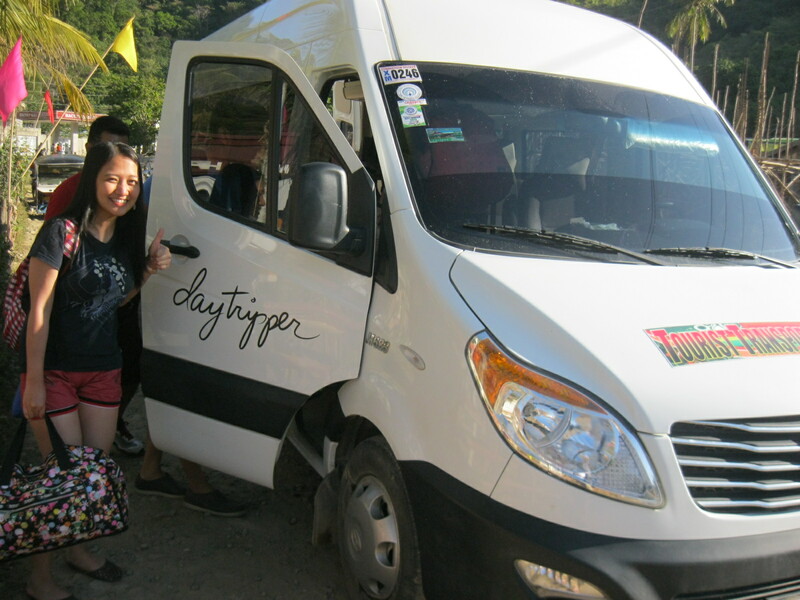 Liselle, my girlfriend, enjoyed the VIP experience in Daytripper Palawan. 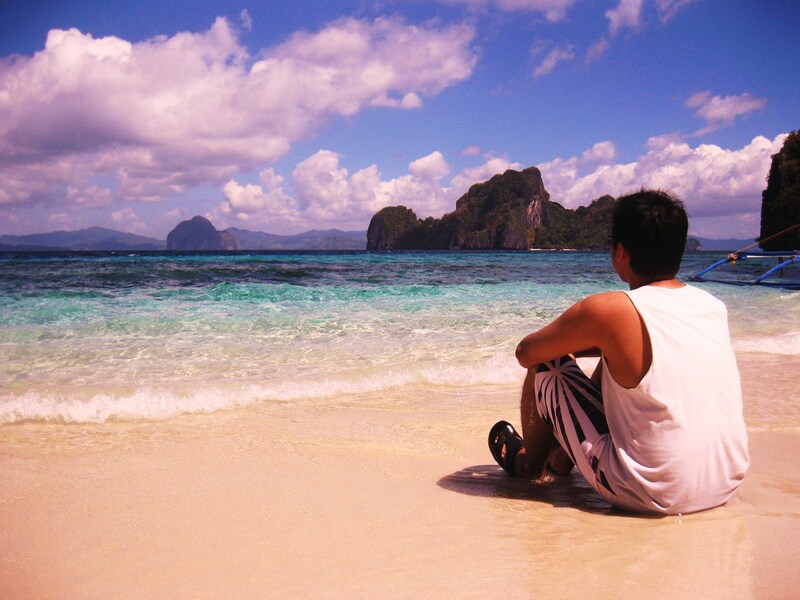 El Nido (EN) is a 6-hour land trip away from Puerto Prinsesa (PP). This is the reason why it is advisable to have a 4-day-3-night vacation in El Nido so you can enjoy the place at your own pace without being hurried due to time constraints. Upon arriving at PP, we were fetched by Daytripper Palawan, a transport business that took us to El Nido from the airport. Among all the transport groups available in Palawan, only Daytripper Palawan promotes convenient 6-hour trip from PP to EN and back. Other transport businesses in Palawan maximize the spaces of their vans at the expense of the convenience of their passengers. For example, a 10-seater van is used to transport 12-14 people. Imagine, there’s not much legroom anymore and space to place your luggage. We really had a great deal when we booked to Daytripper Palawan. The entire trip was very comfortable even in that 2-hour rough road along the way to El Nido We arrived in El Nido stress-free as we were all able to sleep well during the entire trip. There’s enough legroom in the van so one can move freely while sitting, enough space to place the luggage, the air-con is functioning well and lastly, the drivers (they call it Captain in Daytripper) are friendly and accommodating. We felt like we are VIPs when we’re riding Daytipper Palawan. (By the way, if you’re visiting EN soon, you may book to Daytripper Palawan at http://www.daytripperpalawan.com/. It’s very easy to navigate in their site.). We stayed at Marina Garden Resort in EN located at the beachfront (http://www.mgelnido.com/). We were twelve in the group and we rented out three (3) standard rooms. The resort was very accommodating. Imagine, we reserved the room on the 1st week of January and they did not demand for any down payment or deposit. Very trusting, huh? They serve breakfast which is included in their accommodation fees. Room size is just enough for 4 people. And for the comfort room, which is usually the deciding factor for some travellers in choosing their accommodation, Marina Garden Resort has clean restrooms. By the way, there is no electricity in EN from 6am to 2pm. You don’t have to mind it, as you will be doing island hopping anyway. Boracay. In EN, there are only 4 tours to choose from: Tour A, Tour B, Tour C and Tour D wherein each will consume a whole day (9am to 5pm). We got the best tour, according to the people’s review: Tour A and C, which we did for two consecutive whole days. There is a standard rate implemented across EN which is really a good thing for tourists as they will not be victimized by selfish opportunists (which I think do not exist in EN). Tour businesses in EN will just compete through the service they can offer to the tourists. For us, we got Ric Sons Tour which is just a few establishments away from Marina Garden Resort. The tour guides were very affable and conversant about EN. How about their service? Superb. Who says you cannot have a semi-fine dining experience at the islands with all those fresh fruits and seafoods? All tour services in EN provide lunch during the tour, but whenever we’re having our lunch at the island, it’s only our group who has the dining table set up with a nice presentation and generous amount of food. For other tourist groups, they just have to sit down on the sand and find a comfy place which is a bit distant from where their food is set. I think I was able to get my point across: Choose Ric Son Tour when you go to EN if you want to experience excellent tour service. island hopping, one thought that was conceived in my mind: “Definitely, I’m coming back.” After seeing everything during the island hopping, I can’t help but utter praises to God who created all those beautiful creations I’ve seen. It’s such a beautiful paradise. Lastly, how can I forget our very satisfying dinner at Trattoria Altrove and Cadlao Beach Resort. Trattoria Altrove serves brickoven-cooked pizzas which are very unique in taste and flavours. 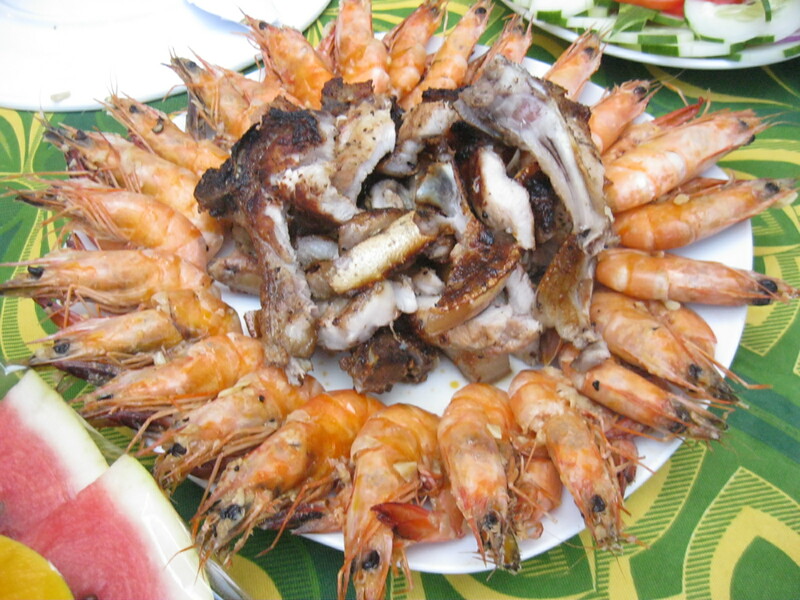 Cadlao Beach Resort serves the best-tasting Seafood Curry Platter. The serving is very generous. We ordered two platters which they say good for 8 people, but it’s actually good for 12. Trattoria Altrove and Cadlao Beach Resort should be included in the itinerary for dinner when visiting EN. I’m going back to this place. If I’m going to rate our El Nido trip with 5 being the highest and 1 being the lowest, I’m going to rate it 100. Expectations were greatly exceeded. It’s definitely a place to go to in the Philippines. A paradise, indeed.